The Young Adventurer’s Guide to Dungeons & Dragons is coming! 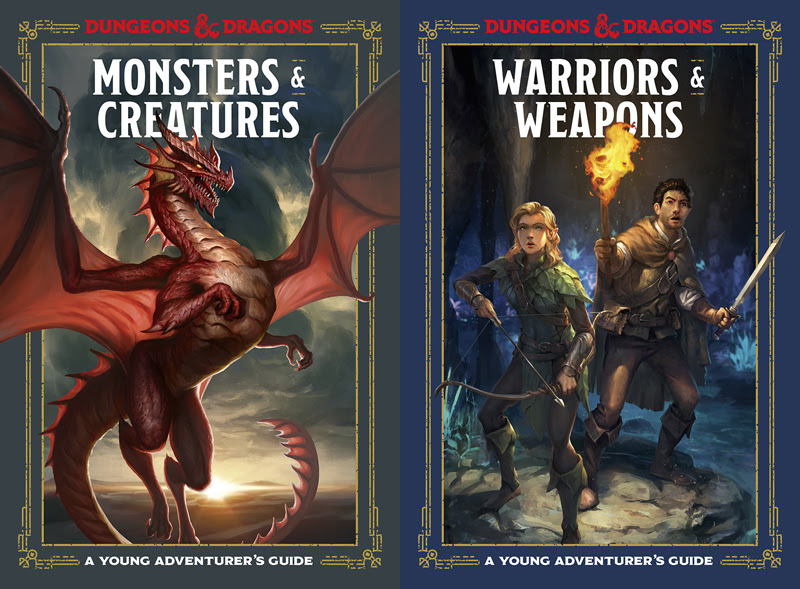 Ten Speed Press (a Random House imprint) and Wizards of the Coast announced a new lines of books called the Young Adventurer’s Guides to Dungeons & Dragons! The first two books, MONSTERS & CREATURES and WARRIORS & WEAPONS arrive in bookstores everywhere on July 16th! The following info is from Jim Zub – architect of the new series! These illustrated guidebooks are built for middle-grade readers (age 8-12) to discover the worlds and wonders of D&D without any rules or game systems for them to worry about. These books are creative tool kits that encourage young readers to make their own characters and imagine stories of adventure and heroism. From there, they can write those stories down, collaborate with their friends, or be introduced to the full D&D game via the more advanced Starter Set or Player’s Handbook. Developing these books with the teams at Random House and WotC has been a dream come true. I credit D&D with sparking my creativity when I was 8-years old and this feels like it’s all come full circle as these books seek to ignite the imagination of a new generation of adventurers. In addition to all new profiles and stories, the Young Adventurer’s Guides are jam-packed with brand new artwork as well. Almost every illustration inside has been tailor-made for the series, showcasing the characters, creatures, and locations of D&D lore. The official Random House landing pages for the series here. I immediately went to amazon and pre-ordered these! Can’t wait.